The age of the agrarian society in the United States has long passed, but the volume of food needed to feed the world population continues to increase. Less than 2% of the U.S. population is presently engaged in food production; thus, the number of farms has decreased, the size (acres or number of animals) per farm has increased, and the performance of each productive unit (land, crop, or animal) continues to make improvement. This advancement in productive capacity is made possible by advancement in genetics, new technology in production and harvesting, and more specialized management skills. The economics of this food production continues to be challenged, resulting in globalization of the food production system and increased size of operations to increase total profitability. The increased size of operations is driven by limited margins per production unit, thus causing farm owners to increase the number of producing units to achieve a targeted income. In the midst of these changes in agriculture, the increase in spendable income and the desire to work in an urban setting and live in a rural setting have resulted in movement of people from cities even from the suburban areas to residential developments in more rural locations with increased area of land per resident. The interface issues between urban and rural sometimes occur between cities and commercial agriculture, but the issues are more common between rural residential developments and commercial agriculture. These residential developments occur with zoning regulations set by townships instead of by city zoning boards and are usually established with fewer restrictions. Agriculture in some areas is exempt from zoning, but increased focus on environmental preservation is beginning to change this. The future of animal agriculture is being affected by the issues that arise between the commercial food operation and community residents. common boundary is being shared by two or more groups with different identities. The urban and rural interface would imply that the boundary is being shared between a city, which has the purpose of sustaining commercial businesses, governmental offices, and high-density residential housing, and the dwellers in the country who have taken on the responsibility of food production for the population. And although this interface sometimes occurs, the more frequent interface is rural-to-rural residents, with the identity differences being those in commercial food production versus those with public jobs who live in the country in low-density housing (Fig. 1). In some cases the interface is rural-to-rural, in that the identity difference is small- versus large-scale food production operations. The primary issues that surface in the urban and rural interface are environmental effects and quality of life. Water quality and availability are the primary environmental issues. The concern with water quality is caused by the risk of contamination from manure storage and the land application of manure. The availability of water is a concern related to the amount of water consumed by the livestock and the water used for cleaning the facilities or product (e.g., egg washing). The level of risk for impacts to the water supply depends on the specific site. 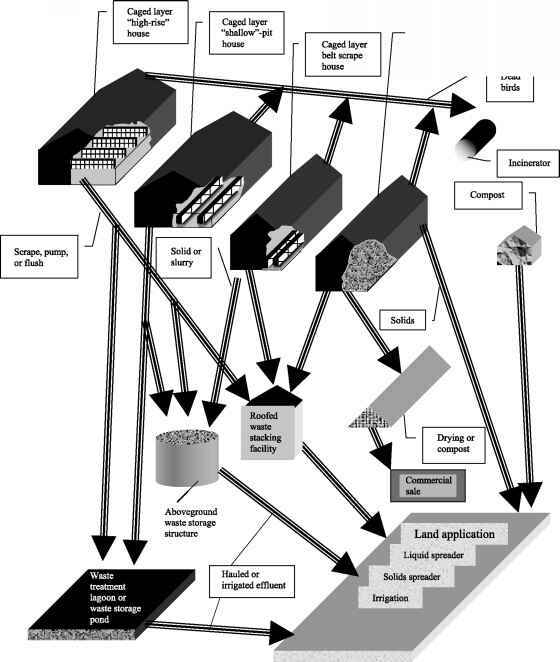 The odor from food animal operations is viewed by some as both an environmental and a quality of life issue: There are environmental risks from airborne particles, and the quality of life is affected by the repulsive nature of the odor. These aspects have also led to concerns about property values in proximity to animal operations. Other quality of life issues include road damage due to heavy equipment, mud on roads from farm equipment, slow-moving equipment on the local roads, loud noises (e.g., from tractors or drying equipment) during all hours of the day from farm operations, and dust from crop harvesting or animal operations.